"A force to be reckoned with" is how, Canada's top Celtic publication, The Celtic Connection describes Pat Chessell, "...Check out his live show now so you could say you knew him when..."
Pat Chessell has been playing music for as long as he remembers. His first public performance was a guest spot with Belfast folk singer Danny Burns of the legendary Irish rebel group, The Wolfhound. Since then, Chessell has brought his music all over the world, performing his brand of Celtic influenced folk rock all over Canada and Ireland and most recently, a tour of New York. Wherever people have heard his music, they are always left wanting more due to his charasmatic stage presence, impressive guitar techniques and warm, character vocal stylings. 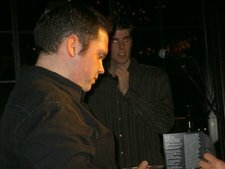 John Murphy of the Boston based Irish punk e-zine, Shite 'N' Onions wrote: "Chessell is a strong vocalist... a name we will be hearing again." Pat is currently working on material for his second album due for release in 2010.